The following report on Gujarat’s internally displaced persons (IDPs) is based a primary survey between January and March 2013 of IDPs who still remain displaced a decade after the communal carnage rocked the state. Anchored by the Centre for Social Justice, Ahmedabad, and forming part of a larger report, “A Study of Internally Displaced Persons of India: Mapping and Citizenship Rights”, it suggests that IDPs remain vulnerable to attack and are unable to live a normal life. The issues of Gujarat IDP’s who were displaced due to the communal violence in 2002 can be traced to the aftermath of a ghastly incident on February 27, 2002, when a bogie of the Sabarmati Express train heading towards Ahmedabad from Firozabad was set ablaze by a raging mob at Godhra railway station. More than 58 persons, including 26 women and 12 children, were burnt alive. Many of those who died were kar sevaks (religious volunteers) who were returning from Ayodhya in Uttar Pradesh. The incident threw up a reaction that changed the face of Gujarat. Within minutes the news spread, and an untold horror unfolded in the state. There were angry mobs on the street holding weapons in their hand and they systematically burned down and looted property , killed and injured persons of the minority community. Women were raped, children were rendered homeless, and the horror continued unabated in urban and rural areas for more than two months in seven districts of the state, out of which Vadodara, Ahmedabad and the Panchmahals were the worst affected. Various estimates exist of how many people were killed. While official statistics say, 1,169 persons were killed, human rights organisations estimated the numbers at around 2,000, apart from 2,500 who were reported missing. What happened in Gujarat was interpreted widely as one of the biggest ethnic cleansing attempts in independent India. As the carnage was unleashed, thousands of people fled from their residence in search of security and safety. The state government set up 102 relief camps to cater to the immediate need of security and shelter of those who were forced to flee their residence. By the first week of April 2002, an estimated 1,13,697 people from the minority community were living in these camps. The relief camps remained operational for six months after which they were forced to officially close down by a directive of the Gujarat government. All aid to the camps was blocked on June 30, 2002. Many of the IDPs were forced to return back with a mere Rs 1,250 as cash dole for all they had lost. Others were condemned to a life of permanent compromise and second‐class citizenship. Numerous cases were reported when IDPs were “allowed” to return only if they withdrew legal cases, stopped using loudspeakers for the azaan, and quietly moved out of certain businesses. Many of these compromises were brokered by government officials, carrying out the state’s mandate of enforcing “normalcy” and creating an illusion of public order. Despite such huge efforts to force IDPs back to showcase normalcy, even today, an estimated 5,000 families continue to remain internally displaced. For fear of their safety, they are still unable to return to their habitual residence. At many of the sites where relief camps existed, semi-permanent relief colonies took shape with funds contributed by NGOs and religious organisations. Currently, there are over 83 relief colonies across Gujarat, which is a chilling reminder that IDP problem has come to stay in Gujarat, thanks to a deep divide between the two main communities, Hindus and Muslims, triggered by right-wing nationalists. Though officially neither the Government of India nor the Gujarat government recognize IDPs as a category which needs special care and attention, many or them are still unwilling to live the deeply compromised lives they fear would form the condition on their return. Many IDPs want justice and have refused to withdraw legal cases against the perpetrators of violence. Then there are those who refuse to return because they face direct threat of violence. In fact, they have nothing left to return. These IDPs survive on a no‐man’s land, caught between existence and denial. They live in makeshift colonies hastily constructed by NGOs and community organizations on the outskirts of towns and villages. They have been literally reduced to the margins of society. Their future is uncertain, as the government denies their existence. In an affidavit to the Supreme Court of India, the Gujarat government has gone so far to say that there is “no internal displacement” in Gujarat, and that if a few people choose not to return to their homes, they are doing it to better their economic prospects. 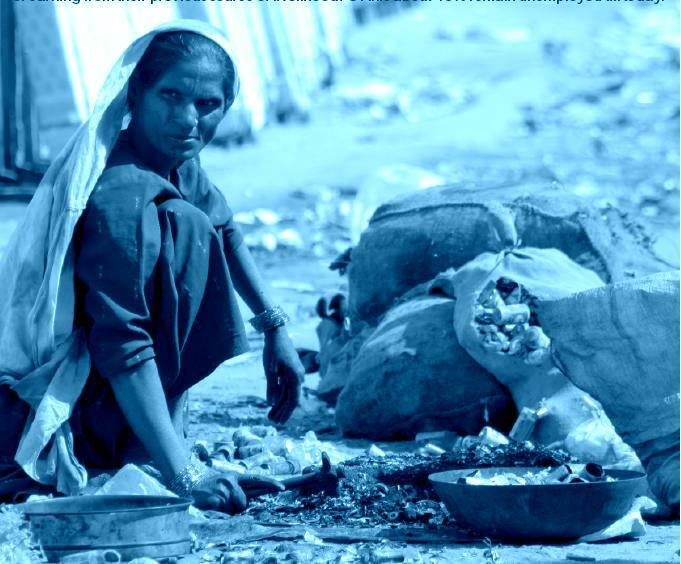 The first attempt to raise awareness about the IDP problem in Gujarat was made when the National Human Rights Commission (NHRC) took suo moto cognisance of the issue of inadequate rehabilitation by the Gujarat government and on May 7, 2003. It passed an order to monitor relief, rehabilitation and resettlement of survivors and their families. Following the order, NHRC special rapporteur PGJ Nampoothiri and other members of the NHRC monitoring committee in Gujarat asked the Centre for Social Justice (CSJ), Ahmedabad, to conduct a preliminary study, based on the United Nations Guiding Principles on Internal Displacement, and prepare a status report on the rehabilitation of victims. The preliminary status report was prepared in April 2004. It was submitted to the Planning Commission, after which Planning Commission member Dr. Sayeda Hameed visited several colonies. A status report on the condition of the IDPs in Gujarat was also submitted to the National Integration Council (NIC) by its member Shabnam Hashmi. It was annexed and quoted in affidavits filed before the Supreme Court in various matters related to the Gujarat carnage. The status report was based on a field survey, which recorded the existence of 83 plus colonies across northern and central Gujarat. Over 4,000 families were surveyed in the first round. The study was updated thrice. The update done in October 2005 listed 47 colonies housing and 5,170 families. Another update done in January 2007 recorded the existence of 66 colonies. The most recent update was done in 2012, which recorded existence of 83 IDP colonies. Despite overwhelming documentary evidence, the state government denies the existence of IDPs and maintains that all affected persons have been “adequately rehabilitated”. Yet, by the government’s own admission, the total damage to property during the violence came to Rs 687 crore, yet the total financial assistance for rehabilitation to the victims only came to Rs 121.85 crore. In fact, the state government actually returned Rs 19 crore to the Government of India, claiming that it could not make any use of it. In August 2006, two social activists, Gagan Sethi and Farah Naqvi, filed a complaint on the issue of continued internal displacement in Gujarat before the newly-constituted National Commission for Minorities (NCM). The NCM was the first quasi‐judicial body to send a team to visit 17 colonies in Gujarat in four districts. On October 13‐17, 2006 the NCM team consisting of vice‐chairman Michael Pinto, members Zoya Hasan and Dileep Padgaonkar, and a government official, joint secretary A. Banerji, visited the colonies, accompanied by the district machinery. The team spoke to scores of IDPs, and also met state officials and the Gujarat chief minister. On October 23, 2006, it issued a statement which said, “The State Government has provided no amenities or facilities in the camps, nor has it made any attempt to facilitate the return of these families, in a safe environment, to their original homes.” The team was told by government officials, including the CM, that the IDPs were living in the camps voluntarily. Finding the view “untenable”, NCM called government response as an effort to “evade basic responsibility”. It added, state government was “not fulfilling its constitutional responsibility”, adding, it had not been able to create an atmosphere in which the IDPs could return to their homes. The dismal situation of the survivors led the IDPs to come together to demand justice. They formed Aantarik Visthapit Hak Rakshak Samiti (AVHRS – the Committee for the Rights of the Internally Displaced). Its first public hearing was held in Ahmedabad on February 1, 2007, where more than 3,500 people gathered at the Gujarat Vidyapith. It was a testimony that the IDPs were in truly miserable situation and needed special care and support. Based on the UN Principles on IDPs, CSJ carried out a fresh survey between January and March 2013. The survey is based on an interacted with 364 IDPs in rehabilitation camps and 100 IDPs (total 464) who live in alternative housing in different towns in eight districts of Gujarat. In all, 464 IDPs were selected, as they were the worst affected by the Gujarat violence of 2002, and have been living a displaced life ever since. The basic objective was to solicit information regarding the IDPs and analyze their socioeconomic conditions. Issues that were looked into included assistance given by the Gujarat government, basic amenities, issues of security, relief, rehabilitation and resettlement as well as the status of litigation processes, where applicable. Short focus group discussions (FGDs) were held with 20 to 50 residents at four IDP colonies of Mehsana, Himmatnagar, Anand and Sarkhej (Ahmedabad). These discussions revealed the current condition in terms of access to civic amenities as well as social conditions. During these FGDs, young people said how they were forced to drop out from their studies due to the conflict-led displacement when they were small. Now they worked as casual workers, and it was found that the livelihood of the people was adversely affected after displacement. While earlier most people did small businesses at shops, or sold milk, or stitched clothes, or drove auto rickshaws, or went door-to-door to sell clothes, things have changed today. Their earnings have gone down considerably. Many are forced to do casual labour. Housing and basic amenities remained a key concern in most IDPs. In many colonies the ownership of houses is yet to be transferred to the IDPs’ names. Besides, these colonies have not been provided with drinking water, approach roads, drainage, street lights etc. IDPs said, the compensation given to them is inadequate. The initial damage survey done by local government officials was done in a discriminatory and inappropriate manner, which resulted in minimal compensation. Indeed, normalcy eludes most the IDPs, as the state government has denied any recognition of their existence. Even after 12 years, these colonies have not been mainstreamed in the towns or villages where they are located. Most IDPs did not want to return to their original place of living, as they said, they did not have faith in the present administration for their safety. Their houses were burnt, property damaged, and many their own kin were killed. They did not want to risk their life again. The survey showed that 65% of the 464 IDPs, who were surveyed, lived a displaced life for the last 10 years, whereas 30% remained displaced for between five and 10 years. During their displaced living, 90% of the IDPs faced multiple displacements. Further, 75% IDPs said as they feared fresh attack, which forced to shift from one place to another, and 50% of IDPs said they shifted to a new place because they lacked basic facilities at the earlier place. Aftermath of the violence was a disastrous experience for the IDPs. It will remain in their memory till they live. The survey revealed that 67% IDPs mentioned that they were not protected from the attackers in the wake of brutal and violent attacks. Nearly 80% IDPs were forced to immediately shift and take shelter in relief camps, out of which 43% said they were accompanied by security agencies during their transit to relief camps. As many as 93% IDPs suffered different kinds of losses due to the violent conflict. The losses narrated included house burnt (71%), looting of house (78%), looting and burning of shop (37%), only looting of shop (27%), and looting of food grains (66%). The survey shows that the IDPs were left with nothing, and that they were in such heightened state of fear of losing their lives that they had to run away to safer places. The survey gave insights into security issues of the IDPs and legal action by security agencies as also the current status of different cases and related information provided by them. The information suggests that most of the efforts for ensuring justice by law enforcement came from non-state actors, while the state put maximum efforts to prevent fair trials and provide justice to the IDPs. Justice in majority cases remains a far cry. People have started losing hope in justice. Out of total incidents of violent attacks, police took suo motu action only in 41% cases, whereas in nearly 50% victims said their FIRs were not registered. Further, 18% the victims whose FIRs were registered did not know whether the accused were arrested, whereas in 20% cases the accused were not arrested at all. Nearly 40% of the victims said that they did not know about the filing of charge-sheet in court. Only 2% of the victims were satisfied with the charge-sheet filed in the court, whereas nearly 34% were dissatisfied with it. Out of the 34% dissatisfied victims, only 2% could file protest petition in the court. As many as 43% of victims were not aware of the current status of their case, whereas only 9% said they do have hope for justice in the court of law. The survey reveals how the administrative system played a prejudiced role and was not active in providing timely and adequate security. The survey results show that on becoming IDPs, the victims found themselves in a more vulnerable socioeconomic situation than before. While earlier, before they became IDPs, living at their original habitat, just about 26% of the IDPs surveyed said they worked as wage labourers. But now as IDPs, 63% said they eked out their livelihood by earning wages. As many as 32% of the IDPs said they had small business before the violence erupted, but on being forced to shift to the camps, just about 12% said they owned small businesses. Further, the survey suggested that 22% of the IDPs lost land and another 29% lost shop. On being asked whether the government helped them provide any job, 87% of the IDPs replied in the negative. While 68% of the IDPs said that though that they lived in a more difficult situation than before, they never tried to return to their original place of living, another 31% said they tried to return but in vain. They could not go back and settle down because of variety of reasons —.17% said they were attacked, 21% said their property was attacked, while others said the police did not cooperate or they were threatened. As for those who did not try to return, the reasons advanced included fear of attack (54%), social boycott (26%), and no property to return (21%). Only 9% said they had better opportunities at camps as IDPs.